The Technical Committee 9X (TC9X) of CENELEC, during the plenary meeting in Karlsruhe (14-16 November 2017), following a report prepared by the WG15-4 convenor on the edition 2017, decided to approve the organisation of the 5th edition of the workshop in 2019. The workshop will change title to: ICT for RAILWAYS, in order to highlight the global dimension of the workshop scope. Venue is not yet decided, but candidates are already considered. As announced, all presentations are available in this Web site for download. In addition, you will find a comprehensive summary of the main presented topics (in the Documents page). Photos and videos are available as well, in the Multimedia pages. Videos include all the speeches and the discussions held in the different panels. In order to have immediate login to all material, you need to Login from the Home Page. If not already done, you will need to register as well. The 4th Edition of ICT on TRAINS was successfully held in Brussels on 27 and 28 September 2017, hosted by Infrabel. 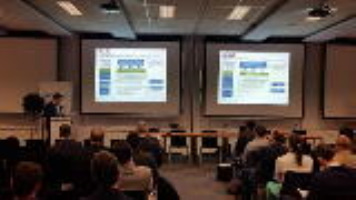 More than 110 people attended the two-days event, which included seven keynote speakers representing all major railway organisations: the European Commission (DG-MOVE), UNIFE, Shift2Rail, CER, EIM, UIC and the EU Agency for Railways (ERA), offering a complete view on their strategies and perspectives. In addition, 31 short presentations illustrated the state-of-art of digitalisation in railways and rail data security. Finally, the 5th Edition of the workshop in 2019 was announced. Presentations, photos and videos are being made available in this Web site.